What can Aintree do to prevent a sub-20 runner Grand National? Aintree’s MD, Julian Thick had little choice but to put some Mandelson-class spin on the 20% drop in entries for the 2012 John Smith’s Grand National. It’s rare for fewer than the maximum of 40 to line up at the tape for “The World’s Greatest Race” and the interest generated by that cavalry charge towards the first should not be underestimated. You needn’t be an experienced punter to know that 20 tons of thoroughbred galloping at 30+ MPH on 160 legs makes for a dramatic and potentially profitable spectacle when challenged by 30 unique fences and four and a half miles. The last time there was such a small initial entry – 1996 – (there are several stages before horses are allocated a place in the National – it is almost always over-subscribed come the eve of the race), only 27 horses faced the starter – there were 17 finishers led by Rough Quest. Rough Quest’s owner Andrew Wates won £142,000 from total prize money of £230,000. The 2012 prize money fund for the race is £975,000. This year’s winning owner is likely to be richer by £550,000 or more. So prize money fuels the case for as many owners as possible wishing to run – it could be that the max of 40 is reached again. (Long Run, 2011 winner of the most prestigious prize in steeplechasing, the Cheltenham Gold Cup, earned his owner £285,000). Natural fallout through the general setbacks affecting National horses between entry and raceday will play their part; it remains to be seen how significant that wastage will be and on that figure the Aintree exec will try and build future plans. One significant obstacle they face is their tendency to try and tweak the safety aspect after each running of the race – a laudable policy but one which tends to ‘raise the bar’ each time for potential future entries. The quality of entrants is increasing. The cost of running on the day (£900 to enter then opting to remain in through various entry stages) is now £4,600. The handicapper for the Grand National has a policy of trying to attract quality horses, an approach he justifies by arguing that it is such a special test. That means that the better horses are favourably treated and carry less weight than they would in a normal steeplechase run under the same conditions on a different track. The fruit of this preferential seed-sowing seems to be blooming: no winner in the past three years has carried under 11 stones – the last time that three-in-a-row weight stat happened was in the mid 1950s. 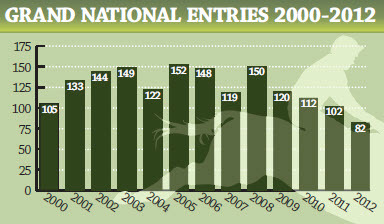 An official handicap rating (OR), expressed in numbers, (higher signifying better) is awarded to all racehorses early in their careers and adjusted on the basis of performance. For more than 90% of the Grand Nationals run, no minimum OR has been taken into consideration. But now the minimum rating to qualify for entry is 120 – up from 110 last year. For the first time in the history of the race (first run in 1839) horses below the age of 7 do not qualify to run and, horses must have been placed 4th or better in a ‘chase over 3 miles of further. These criteria automatically rule out many potential entrants. The cost of running is a further drawback, especially as the risk-reward ratio diminishes with each highly rated horse that wins. Aintree’s exec will now need to sweat it out. If significantly fewer than 40 go to post and, critically, if the winner carries 11 stones or more, the powers that be will know that some back-pedalling on race conditions is essential. Given safety concerns and the changes made in pursuit of these, there might be no way back. Next ›Grand National on the long road to oblivion? Truly magnificent copy Joe…….and if anyone out here in the real world knows Aintree in every aspect of the racecourse, it is you boss! I hope we do get the 40 for the sake of the future of the race. At this stage I’m not unduly worried as in the past few years plenty of the entries were either in there to keep the weights down, from overseas or doubly entered with Cheltenham. Initially, I freaked out thinking “Only 82?” but in reality 80 has probably been the true underlying “intention to actually run ” figure in recent years. Totally agree with the constant ‘tweaking’ of entry policy which,if they are not too careful, will result in the National becoming too diluted to keep its status as the ‘greatest race in the world’. I agreed with them when they brought the rule in re bad jumpers/completing runs but they are taking the event away from the little man/small trainer type’s who made the race what it was ( I was going to say what it is but realised that wouldn’t be true!) Obviously thats just my opinion,thanks for the article.